Sweet and Sour Pork Chops | Cook It Quick! Earlier in the week I shared with you how to save money at the meat counter by buying in bulk and freezing in individual portions sizes. 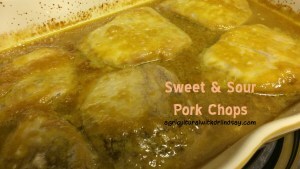 I recently defrosted a couple of packages of pork chops and made Sweet and Sour Pork Chops – and there was plenty for leftovers the next day! Recipe at bottom. Mix together until you get a sauce. 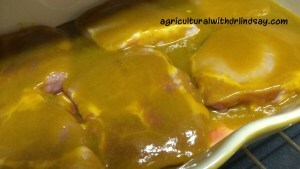 Place pork chops in a baking dish and cover with the brown sugar and mustard (do not add water). 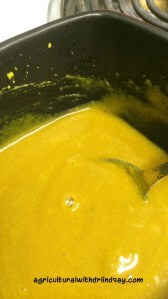 Bake on 350 degrees F until done – YUM! 1. 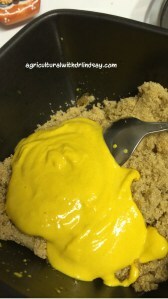 Add brown sugar and mustard to a bowl, mix together until well blended. You can make them sweeter or more sour by adjusting the amount of either ingredient.